AP Postal MTS Hall Ticket 2019 Released…!!! AP Postal Department members had released the AP Postal MTS Hall Ticket 2019 in their official site on 20th April 2019. All aspirants can apply for the AP Postal Recruitment 2019. Also, the Officials released the AP Postal MTS Exam Date 2019 and that is scheduled for 28th April 2019. At the time of filing an application if you provide correct details then only you will get the Andhra Pradesh Postal Hall Ticket. Else you will not get the Hall Ticket. All the eligible candidates can download his/ her AP Postal MTS Admit Card 2019 only from the official site @ appost.in by entering their details correctly like username and password. The location where the written test is going to be held will be mentioned in the AP Postal MTS Admit Card 2019 itself. At last of this page, we had provided the steps for downloading the AP Postal MTS Hall Ticket. The following are the details present on the appost.in MTS Admit Card. Everyone must carry their Hall Ticket along with them. Immediately after getting the Andhra Pradesh Postal Hall Ticket, cross-check the details present in it correct or not. If not correct them by informing to the higher officials of AP Postal Department. AP Postal Department recruitment board had released the notification to fill the 45 Multi Tasking Staff Posts. Candidates who are interested in working for Andhra Pradesh government jobs had applied for this AP Postal MTS Recruitment 2019. Aspirants who had reached the expectations of the AP Postal Department will only get the AP Postal MTS Admit Card 2019. The AP Postal Department members had clearly mentioned that they are hiring the candidates on the basis of Written Test. Before appearing for the AP Postal Multi Tasking Staff Examination, all the competitors are requested to carry some important documents to the exam center along with the appost.in MTS Admit Card. These documents are needed for the verification purpose. So, all the candidates are advised to take any one of the mentioned original documents as proofs for the examination center. Applied candidates must and should initially visit the official website of the AP Postal Department. The official site is appost.in. On the screen, you will get the AP Postal Circle home page. 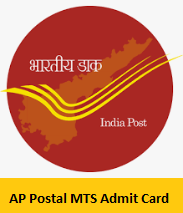 In that home page search for the AP Postal MTS Admit Card 2019 link which will be highlighted. Fill the required details like username, password. Cross check the details you had provided on that page. You will get the appost.in MTS Admit Card in a new page. Download the AP Postal MTS Hall Ticket in the prescribed format. Take two or more copies of the AP MTS Hall Ticket 2019 and carry them along with you for further process. Furthermore, we advised you to keep visiting our page time to time for more updates regarding this AP Postal MTS Admit Card 2019. And also login to our web portal freshersnow.com for knowing information about different state and central government jobs regularly.